The pioneer of Art Deco Style in the Philippines is Pablo S. Antonio. Pablo Antonio is the pioneer of Art Deco Style in the Philippines. Some of his famous design is the Cine Ideal in Avenida, FEU administration and Science Buildings and the Manila Polo Club. He is a Philippine National Artist for Architecture. He was born on January 25, 1901 and passed away on June 14, 1975. 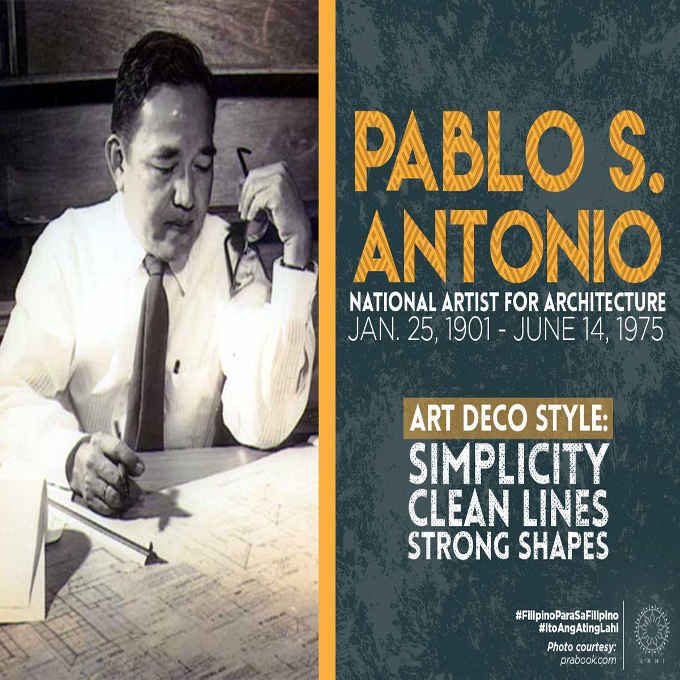 Si Pablo Antonio ang pioneer ng Art Deco Style sa Pilipinas. Ilan sa kanyang mga sikat na disenyo ay ang cine ideal sa avenida, FEU administration and Science Buildings at Manila Polo Club.